Whether you are battling the cold, allergies or simply a runny nose, blowing your nose can wreak havoc on delicate facial skin. Even the softest tissues can torment the nose and rub the skin raw, resulting in irritated and tender nostrils. If you have a chapped nose form blowing, you can take a few steps to soothe the pain and encourage the area to heal. Chapped skin occurs when small cracks form in the skin around the nose. These cracks often develop when dry skin in the area is irritated by excess friction. Even when you blow your nose gently, you subject the skin to dryness and friction. Over time, the skin becomes extremely raw and irritated, and small cracks develop in the surface of the skin. The irritated skin around a chapped nose is often bright pink or red in color. The skin may also look dry and flaky, with small patches of skin peeling off around the nose. Since the cracks often extend into the deeper layers of the skin, they irritate the nerves found in these layers. As a result, a chapped nose is often quite tender and painful. This pain becomes worse with anything rubs against the skin, such as a tissue, or when the area is exposed to cold temperatures. When the nose is chapped, avoid using hot water or harsh soap to cleanse the skin. Hot water and soap tend to remove natural oils from the skin, making it drier and more irritated. Apply a thin layer of ointment to the chapped skin throughout the day, especially after blowing the nose. Ointments for chapped skin include petroleum jelly, aloe vera, thick unscented lotions or vitamin E oil. In addition, oils made with menthol, camphor and eucalyptus not only soothe the area, but also relieve congestion by opening the airways. 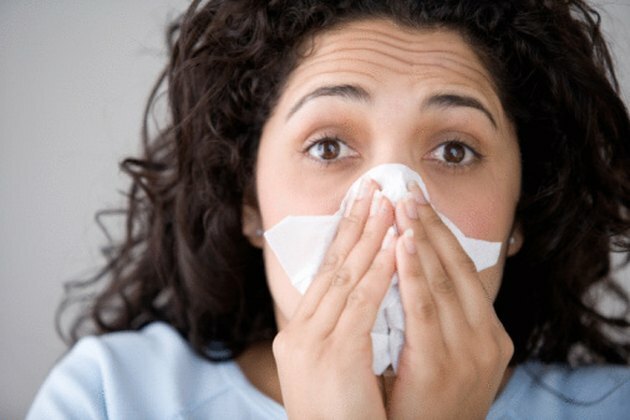 Even if you must blow your nose every few minutes, you can use certain to prevent a chapped nose. While blowing the nose, avoid harshly rubbing the skin with the tissue. Instead, simply blot the nose gently. If possible, use the softest tissues available or tissues made with moisturizing ingredients. After blowing the nose, apply a thin layer of ointment or moisturizing cream even if the skin has not yet chapped. Using a humidifier at your home or office can also prevent a chapped noise by keeping the air moisturized. After regular blowing of the nose, the inside of the nose may also become raw and irritated. However, this area is significantly more difficult to treat. Rather than applying a moisturizer, use steam to encourage the nose to produces its own moisturizing oils. Turn on a hot shower or place your head over a bowl of boiling water and inhale the steam for several minutes. If steaming the nose is not effective, use a cotton swab to gently apply a thin layer of petroleum jelly or diluted tea tree oil to the inside of the nose.